We LOVE books in this house. Being an educator and birth through five education major, I’ve built quite the collection. As you can imagine, teachers build a mini library of their own books. Especially teachers, like myself, that taught preschool age through elementary. I have bins of books that are categorized by season, holiday, emotions and more. I love switching out the books in Izzy’s room and adding new books to our collection. 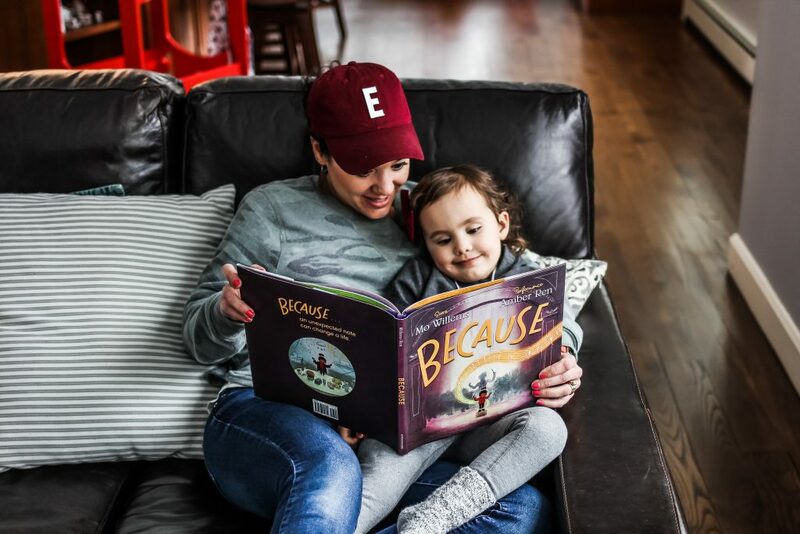 Our newest book is Because by Mo Willems. This book demonstrates how others can be inspired by moments, by each other and specifically in this book, by music. I love how Because exemplifies if you have passion for something, that passion may touch someone in such a way that it positively changes their life. In the book, because a child heard music at an orchestra, she learned she had a special appreciation and love for music. Because of this newfound love, she started learning how to play instruments, and eventually composes music of her own to debut with her very own orchestra, and the magic is passed on Amber Ren’s illustrations really bring the story to life. Recommended for ages 3-5, Because is in stores now. Because we were inspired by the book, we discussed “because” moments that have happened in our lives. 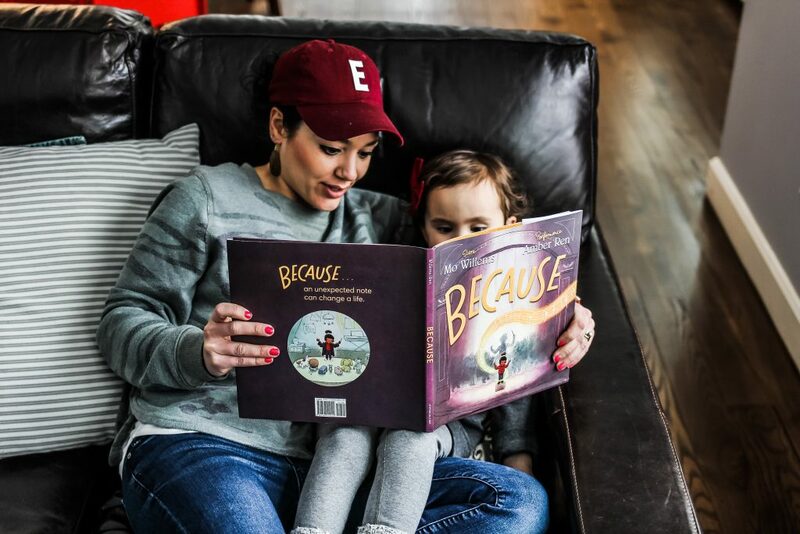 One of my daughter’s “because” moments really stood out to us. Because we moved to Maine, we have been able to see more wildlife. Because there are more animals for us to enjoy, Izzy’s Nana bought her binoculars. 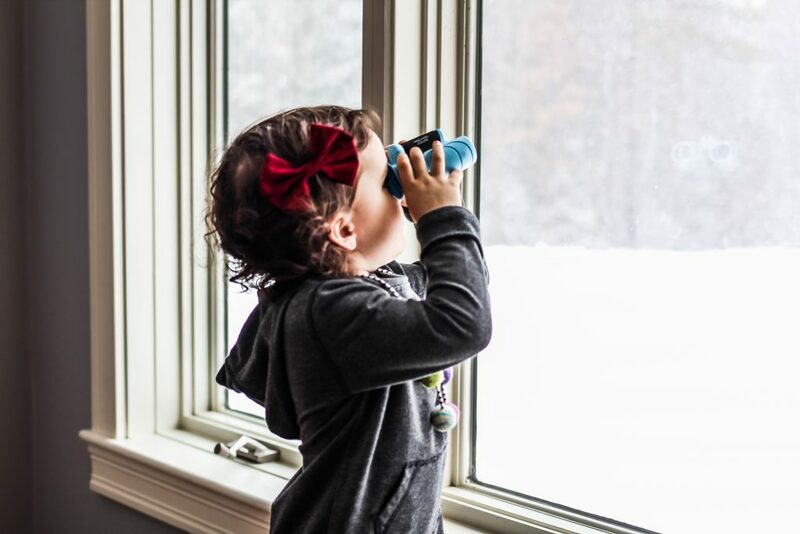 Because she has the binoculars, Izzy has been using them to search for birds and other wildlife. Izzy now has an even stronger than ever love for wild animals and learning about them. What are some favorite or life changing “because” moments that have happened in your life? My wife and I had a chat with our daughters about 5 years ago. We said, “we could go on vacations every 6 or 7 years, or buy a travel trailer and spend every weekend in the summer camping, and also do a couple of week long camping trips.” They chose the latter, and because of that, they have see so many great places, and understand the value of money as well. I love this so much! You have obviously done some amazing parenting. That’s a beautiful because story!! i have so many because moments! because i moved to CA for a terrible reason, i was able to meet my partner and live in the beautiful house we have 🙂 and so many other things! Because by Mo is a great story. We should help our kids understand and learn about each situation. Thank you for this post. Magic and transformation takes time, energy, passion, team effort, and hard work. This book lays those things out as the reason for accomplishing something big that changes lives. This is such an important lesson- magic doesn’t happen overnight. But it is worth the work. What a lovely message for kids! Teaches them to see so many possibilities in the world! Love to see books inspiring our youth, these days! What an awesome book of inspiration! I love that this book seems to inspire conversation with the kiddos, how great. 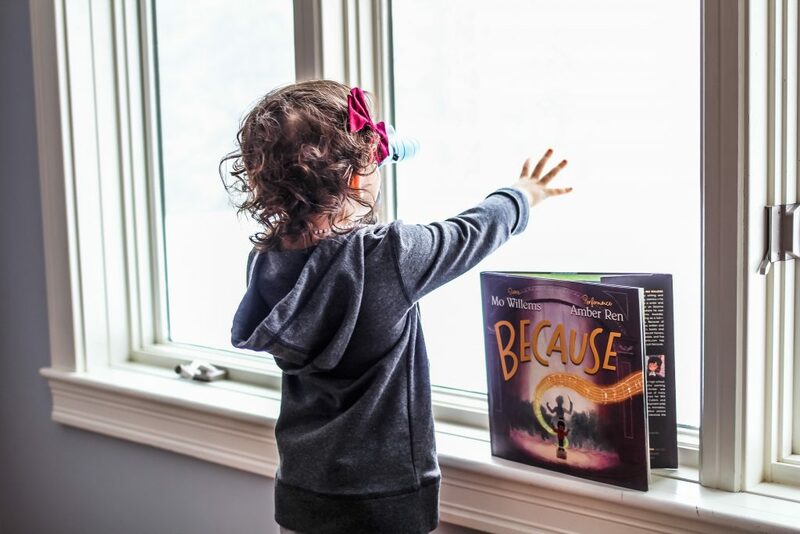 My very simple “because” is that I put a bird feeder outside of our sunniest room, which is a library/den. Because of that, my girls have learned to just be present and watch from the window seat as the birds come and go. Because of them siting there watching birds, the dog now loves to sits on the window seat as well and he always begs to get up there. This is so sweet. My dad was all about spending money on experiences rather than things. There are so many wonderful opportunities you can create for your kids. I’m always on the lookout for book recommendations. Because sounds like an interesting book to read with my kids. I’ll have to add it to my list! It is hard for us parents to find time. We try to always do it every night before bed. 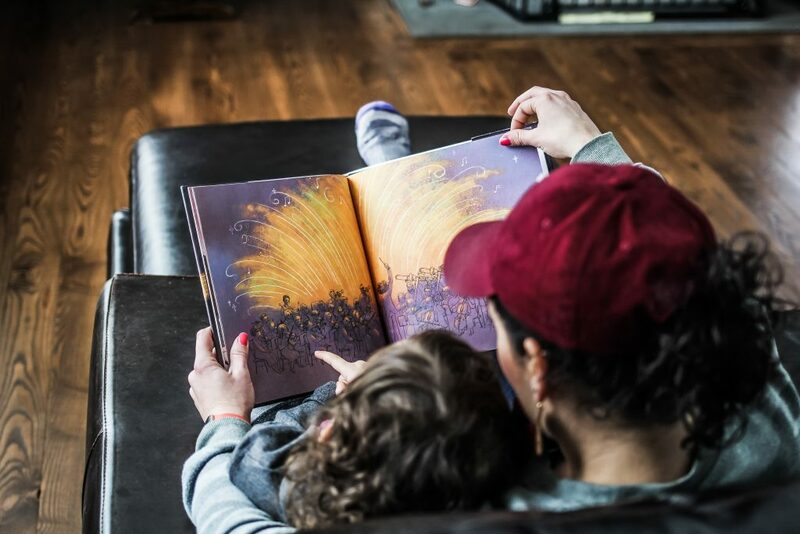 Nothing more enjoyable for parent and child than sitting down to read. It is great for knowledge and child’s development. I’ve read so many good things about this book. I’d love to read it to my little niece!